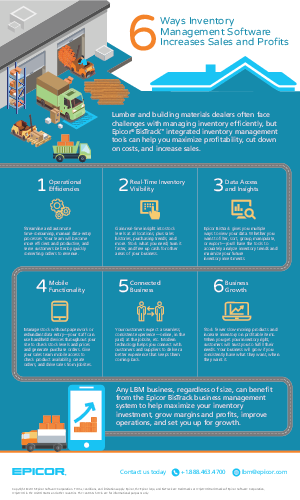 Managing inventory efficiently is one of the challenges that lumber and building material businesses face. Evolving technologies, including mobile functionality and connected business, offer opportunities for LBM business growth. Epicor has a proven history growing profits and increasing efficiencies for lumber and building material businesses. Read this Epicor Tip Sheet and discover how your LBM business can benefit from integrated inventory with BisTrack.